Although it isn’t widely broadcast, there are roughly 10 distilleries that make roughly 99% of all the bourbon made in the world. Many are names you know: Beam, Wild Turkey, Woodford Reserve, Buffalo Trace, Maker’s Mark, and Wild Turkey. One you’re less likely to know is the Barton Brands Distillery (formerly the Tom Moore distillery), home of the 1792 Ridgemont Reserve Barrel Select Kentucky Straight Bourbon Whiskey. The distillery, which also makes Very Old Barton, Tom Moore, Kentucky Gentleman, and Ten High, is owned by the Sazerac Company (owners of the Buffalo Trace Distillery). Aged at least eight years before being bottled at 46.85% alcohol by volume (93.7-proof), the orange-tinted bourbon features a nose of green apple, orange peel, vanilla, and baking spices. The flavors, like the nose, are very distinctive with dry oak, apple peel, fig, and an all-around dry spiciness, likely from the rye part of the mash bill. The finish is more dry oak with hints of leather and fruit that tapers off quickly. 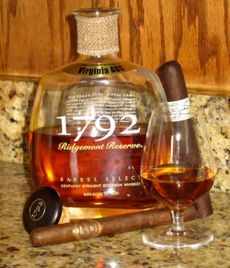 Oak, spice, and fruit are the dominant flavors in this unique bourbon, and so a savory but woody cigar is my pairing recommendation. Cigars that fit that profile include the Crowned Head Four Kicks, Berger & Argenti Entubar V32, Pinar del Rio Small Batch Reserve Maduro, and (if you can get it) the Casa Fuente 800 Series. If you’re a bourbon drinker there is plenty to like about Ridgemont Reserve, most particularly a unique flavor profile. It’s neither overly sweet, nor does it demonstrate an old woody flavor profile (the dominant trends in bourbon). But at around $30 per bottle it’s well worth a try. Drink it neat or with a splash of water.